...ok all my cards are my favorite. But this one is cool. I'm finding the most amazing stamps out there in the world. Can't wait to find more. I find my self more and more busy lately. My craft fairs are coming up really soon - I'm so excited...can't wait! 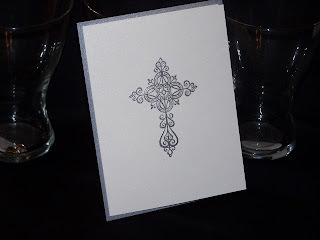 This cross is stamped on Shimmery card stock and then embossed in silver, all mounted on a piece of brushed silver card stock. I'm also going to make this card in gold and bronze. Let me know what you think.